Many racers buy inferior starters in hopes of saving money. As a result, failures are a common problem for street enthusiasts and racers at the track. Ultra-Duty Starters are hand assembled and engineered with high-quality components, which makes them a more durable, reliable component that will save you money in the long run by outlasting several cheap models. 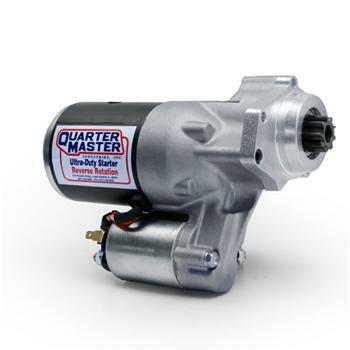 Made with premium components that are blueprinted, assembled and tested at the Quarter Master facility, these starters are available for popular Chevy, Ford and Chrysler applications. Every 1.4kw unit includes gear reduction engineering for increased torque, a CNC-machined adapter mount for precise flywheel fit and a unique pinion gear with a lightweight head to enable tighter tolerances in run-out for efficient flywheel engagement. These starters also utilize a heavy-duty solenoid and ball bearing construction that withstands the temperatures and demands of high-compression engines.